Middle-class Mediocrity: Rantings: Your destruction is inewitable! North Korea, to me at least, is a fairly humorous concept. This is, admittedly, in part due to the enlightenment given me by that great World Politics Documentary 'Team America: World Police'. I recognise that living as a North Korean is probably not as much of a hoot as it seems to the casual observer but I nevertheless think the idea of Kim Jong Il hillarious. We were talking about totalitarian regimes today and so I did a bit of youtube search and found this gem. Basically, NK created some sort of cult of the individual around this fella Kim Il Sung. 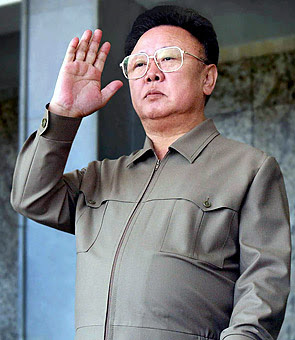 Sung created the state in its current communist form and was succeeded by everyones favourite warlord, and his son, Kim Jong Il. He then went and died (what a silly sausage) and this was the resulting level of national mourning. Never has grief made me chuckle so much. if this was myspace id give this kudos.